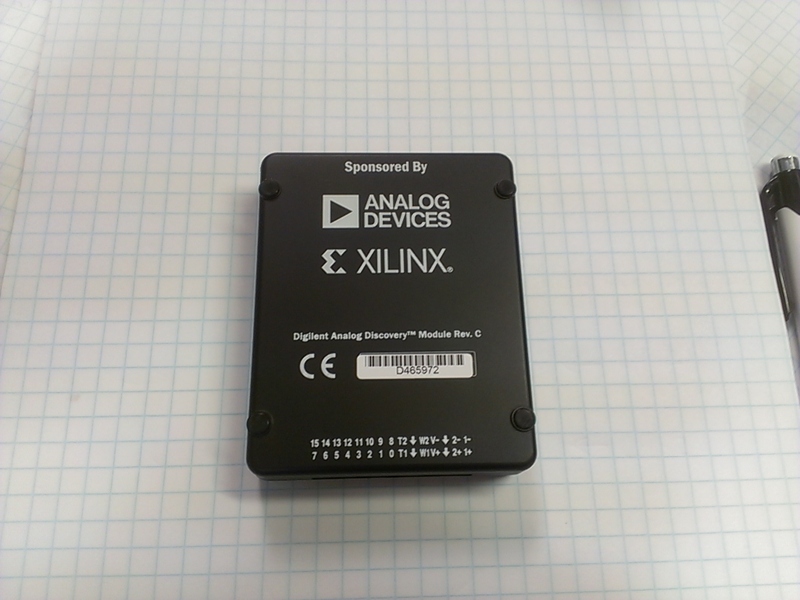 From the Digilent website: " The Digilent Analog Discovery™ design kit, developed in conjunction with Analog Devices Inc., is the first in a new line of all-in-one analog design kits that will enable engineering students to quickly and easily experiment with advanced technologies and build and test real-world, functional analog design circuits anytime, anywhere - right on their PCs. 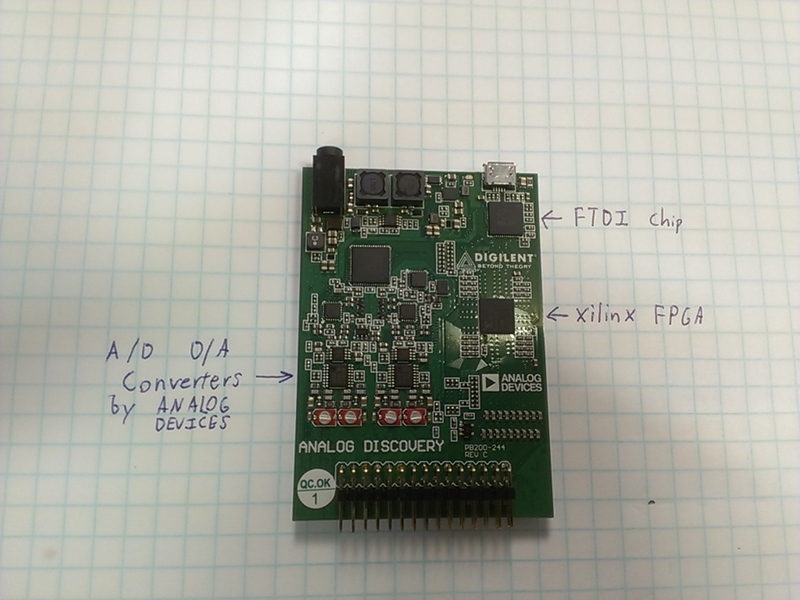 For the price of a textbook, students can purchase a low-cost analog hardware development platform and components, with access to downloadable teaching materials, reference designs and lab projects to design and implement analog circuits as a supplement to their core engineering curriculum." 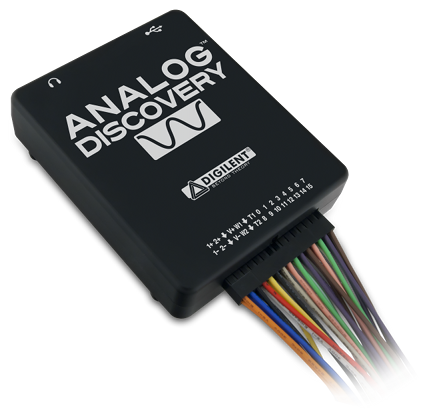 The Analog Discovery uses Digilent's Waveforms software which is free, but only works with the Analog Discovery and the Electronics Explorer Board. 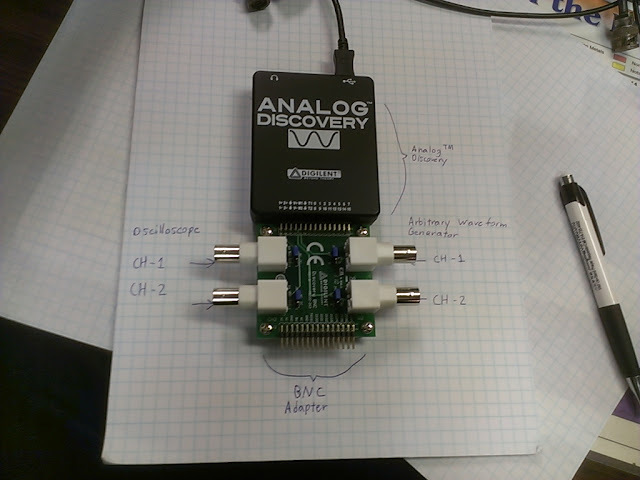 The Analog Discovery has a dual channel Oscilloscope and 2 arbitrary waveform generator outputs. Also included are a 16 Channel Logic Analyzer, Digital Pattern output, Static I/O and a fixed 5 volt +/- power supply. It is relatively easy to use and the user interface is nicely laid out. I haven't experimented much with the logic analyzer or digital pattern generator, but I have used the arbitrary waveform generator and oscilloscope frequently. 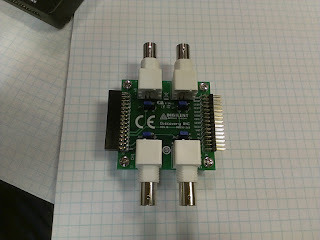 This makes it possible to use BNC oscilloscope probes and use BNC probes for the waveform generator as well. 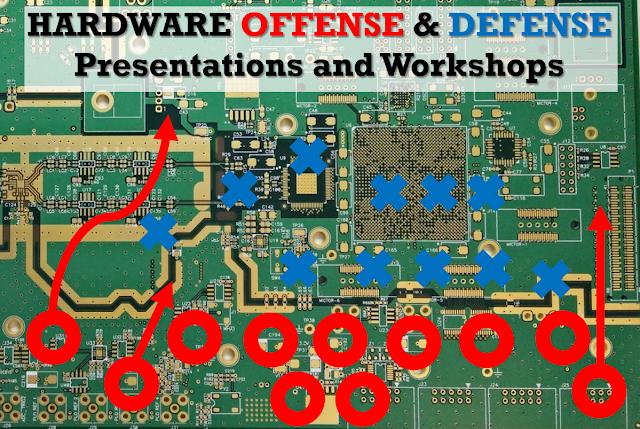 On the bottom side of the board we see all the by-pass capacitors and resistors used for the FPGA and A/D and D/A converters on the top side of the board. 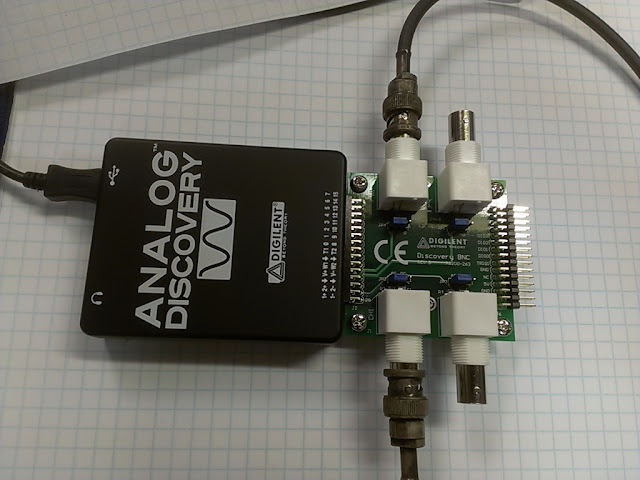 This gives the Analog discovery a 100 MSPS, 5 MHz bandwidth, up to 16k samples/channel for the analog inputs and outputs. 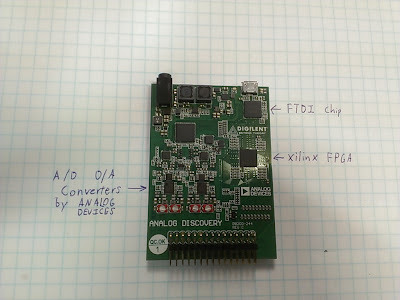 Overall I think the Analog Discovery is a decently priced for all the functions it offers and it is a very portable device, that you can just throw into your computer bag and take it out and probe stuff on your laptop on the go. I recommend getting the BNC adapter since it allows the use of normal oscilloscope probes. The software is user friendly and gets the job done. I would recommend this to beginners since it offers a whole array of instruments and functions that are useful in getting started in electronics. 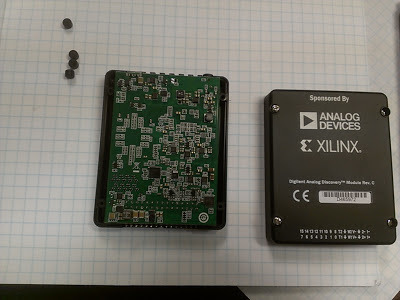 For experts and hobbyists it is a pretty good device that is portable and easy to use in the field when you don't have all your equipment in your lab. 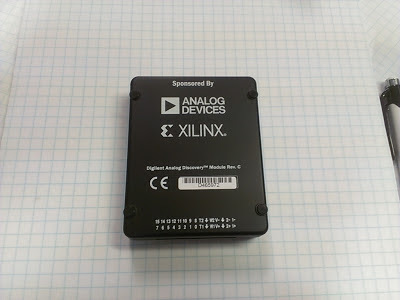 I think students just like me, can buy a low-cost analog hardware development platform and components, with access to downloadable teaching materials, reference designs and lab projects to design and implement analog circuits as a supplement to their core engineering curriculum. You have shared nice collection, I really found helpful for me. None of these were rated by Consumer Reports. portable generator reviews The Generac GP5500 5939 was highly rated by CR and a best buy at $670. I'm disappointed by PopSci. Awesome! This specific is wonderful for tasks that require great reductions. This is because this has a laser that will allows inside installing the policies so that you can accomplish the best cut each time. The favorable aspect can be it is able to give great reductions inside both equally easy-to-cut along with high quality resources.If you want more information please visit best portable table saw This is very informative. your post provide many news . thanks for share this . nice concept post . thanks for this . this is so nice post . i am looking for this. that is so effective post . Recently this sphere became my hobbie, but I am only beginner in this, and such articles like yours are very heplpful for me, so big thanks for this incredible job! Recently I have bought rigol dg1022 https://toolboom.com/en/arbitrary-waveform-function-generator-rigol-dg1022/, did you use it and what can you say about it if yes?